A series of mountain rescues in a matter of days has prompted warnings from Police Scotland and Mountaineering Scotland. Five search and rescue operations have been carried out on the mountains in the Highlands since Monday. People heading into the hills are being encouraged to carry clothing and kit for bad weather. They should also take navigational aids, such as a map, and be able to use them, the two organisations said. The advice has been aimed at people heading into any of Scotland's upland areas. 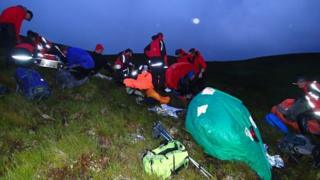 Lochaber and Dundonnell mountain rescue teams have been involved in callouts this week. Earlier this summer, Cairngorm, Braemar and Aberdeen MRTs have been called on to handle difficult incidents. In one of this week's incidents, two hillwalkers are believed to have made a navigational error leading to search and rescue teams looking for them in the wrong area. The alarm was raised after the pair were overdue from a walk on An Teallach, a mountain in Wester Ross, on Monday. Dundonnell MRT and Stornoway Coastguard helicopter made a search early on Tuesday. The walkers later turned up safe and well in the Loch a'Bhraoin area. Lochaber MRT have been involved in a number of callouts, and deployed a drone to help team members to locate casualties. On Sunday, 12 members of Dundonnell MRT went to the aid of two women taking part in a charity event in hills near East Rhidorroch Lodge, east of Ullapool. One was hurt and both women were wet and cold. Two walkers who found them stayed with them until the rescue team arrived and a coastguard helicopter airlifted them. Insp Mike Middlehurst, of Police Scotland, said: "At this time of year, people rightly come to the Scottish hills and mountains in search of the excellent walking and climbing challenges available. "We do not want to put anyone off making the most of these great experiences but we would ask that people take sensible precautions before heading out. "This means that walkers and climbers can make the most of Scotland's natural landscape, while it also means police and our partner agencies can help them if something adverse does happen." David Gibson, chief executive officer of Mountaineering Scotland, said: "It's the middle of July and relatively mild at glen level, but a Scottish summer can bring frequent combinations of wind, cloud and rain at Munro height. "This can turn a pleasant summer walk into a strength-sapping, navigational challenge for even the most experienced hillwalker. "Enjoy Scotland's fantastic mountains but plan your route with the weather forecast and wind direction in mind, have adequate and waterproof clothing, and ensure you are not solely reliant on electronic means of navigation and take a map and compass." Ian Sherrington, chief instructor at Scotland's National Outdoor Training Centre, Glenmore Lodge, added: "Preparation is key before heading out. "Spend a bit of time checking the weather forecasts and consider what impact this will have on you and your party. "Make sure you have the right equipment, such as a map and compass, and check that you know how to use them."